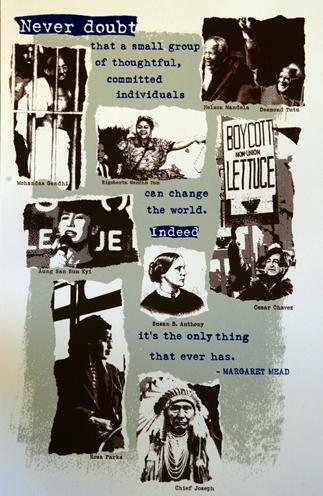 These thoughtful, committed individuals have not only shaped the attitudes and institutions of our world, they have each acted with a commitment to nonviolence: seeking to convert the hearts and minds of their opponents rather than using coercive force. Each was a part of a small group that valued truth and justice before personal accomplishment or monetary gain. They each inspire us with courage in the face of violence and oppression. May each of them also challenge us to commit our lives to making justice and peace a reality for all people. MOHANDAS GANDHI - Great teacher of nonviolent action. Leader of the movement for India's independence from Great Britain. RIGOBERTA MENCHÚ TUM - Quiché woman working for the rights of the indigenous people of Guatemala. 1992 Nobel Peace Prize winner. BISHOP TUTU - Church leader outspoken against apartheid in South Africa. 1984 Nobel Peace Prize. NELSON MANDELA - After 27 years in prison for speaking out against apartheid, elected the first president of free South Africa. SUSAN B. ANTHONY - Prominent activist for women's suffrage in the United States. ROSA PARKS - Ignited the Montgomery bus boycott by refusing to give up her bus seat to a white passenger. AUNG SUN SUU KYI - Democratically elected president of Burma held under house arrest by the military. Winner of 1991 Nobel Peace Prize. CESAR CHAVEZ - Led strikes and boycotts fighting for the rights of US farmworkers to organize. Founder of United Farm Workers (UFW) Union. CHIEF JOSEPH - Chief of the Nez Pierce tribe. Advocated nonviolence among the indigenous peoples when facing marauding white soldiers and settlers in the American northwest.